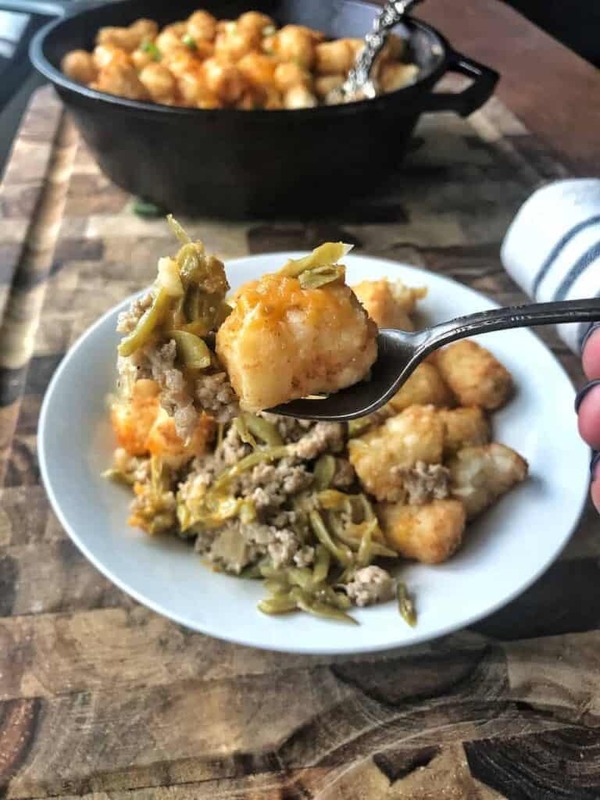 Tater Tot Casserole is a simple dinner idea your family is sure to love. This classic casserole recipe has been updated, becoming a one-pan meal requiring only a handful of ingredients. 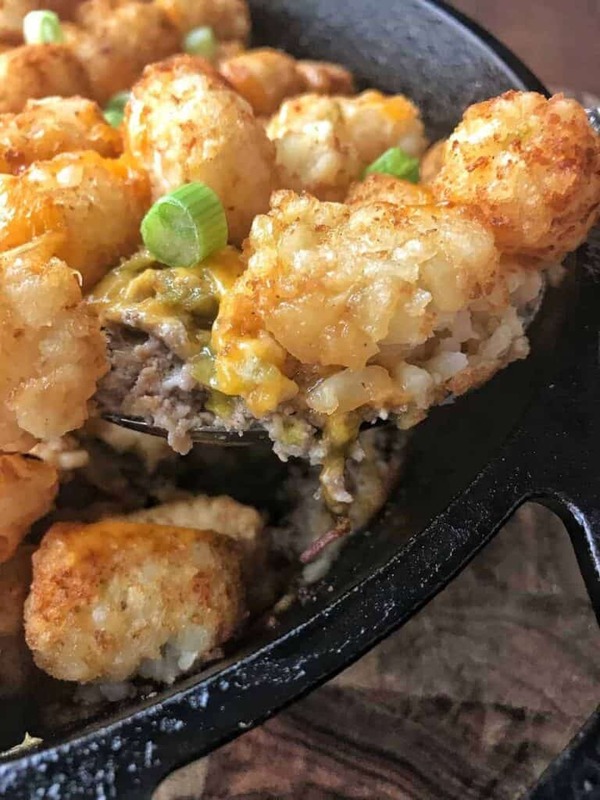 If there is one dish that reminds me of childhood, it is tater tot casserole. Here in the Midwest, this delicious hot dish is a classic. It’s a recipe not only my husband loves, but BOTH of my kids do as well. And that’s saying something. This meat and potato casserole is typically made in a casserole dish layered then baked. I thought it was time to put my own spin on tater tot casserole. I made it into a one-pan meal and cut the canned soup out completely. This version cuts calories along with time, but the flavor remains untouched – all while requiring just a handful of ingredients that you very likely have on hand. The star of this recipe is certainly the potatoes. These little potato nuggets are certainly the reason my son tolerates eating his least favorite veggie – green beans in this dish. In my opinion, this classic is not complete if it’s not tater tot casserole with green beans. This comfort food comes together quickly using frozen tater tots, which are super convenient. Potatoes and kids go hand in hand. Potatoes are a culinary canvas of unlimited possibilities. This kid-friendly food works like a charm in children’s acceptance of other veggies when served together. You can find tons of fun & delicious ideas for kids over at the Potato Goodness Facebook page found HERE. To make this simple dinner meal, start by sauteeing an onion in an oven-safe skillet, such as a cast iron pan. Add lean ground beef. Once the meat is cooked you simply stir in Greek yogurt and spices. Layer green beans, cheese, and tater tots on top. What temperature do you cook Tater Tot casserole on? How long do you cook frozen Tater Tot casserole? When the hot dish comes out of the oven, take care to use hot mitts and not grab the 400° skillet handle! Now you have a hot, nutritious, and delicious dinner that your family will be requesting time and again! 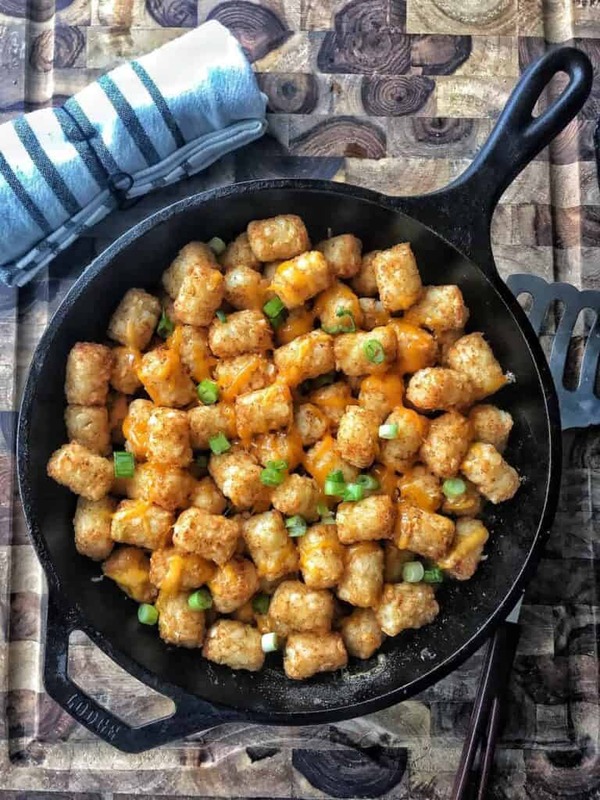 Tater Tot Casserole is a one-pan meal that comes together quickly. Sure to please the whole family, this lightened up version of the traditional casserole cuts calories not flavor. In a large oven-safe skillet, heat olive oil over medium-high heat. Add onions, sauteeing until translucent, about 2-3 minutes. Add ground beef, cook until browned. Drain beef, then return to skillet. To beef, add greek yogurt, onion powder, salt, and pepper. Stir well. Layer drained green beans on top of beef mixture. Top green beans with cheese. Pour the bag of tater tots on top of the cheese. Bake at 400°F for 30 minutes or until tater tots are golden brown. Top with chopped green onions if desired. We love this recipe, it has become a staple in our dinner rotation! Yum!